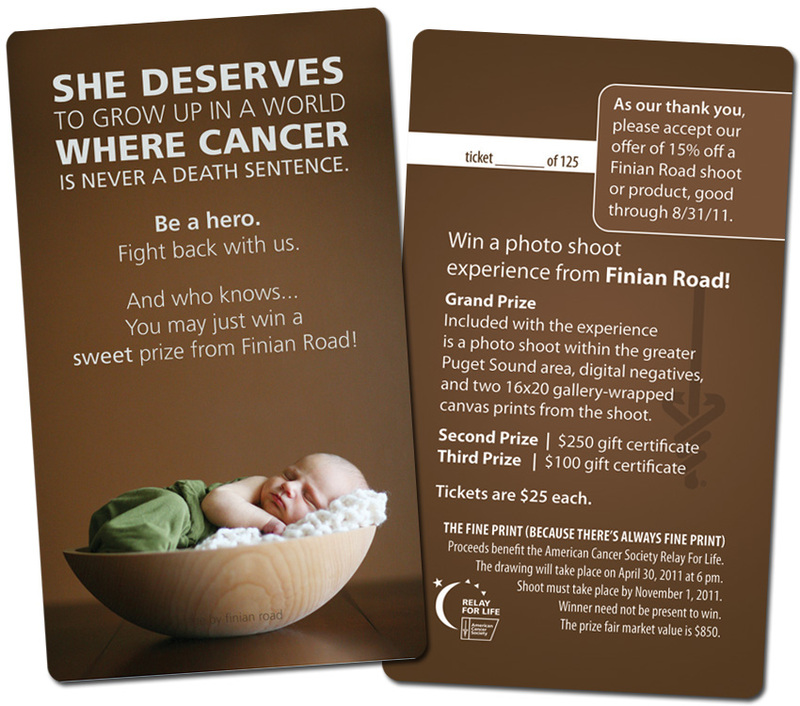 Finian Road Image & Design • The Blog: The 2011 Shoot to Fight Cancer is LIVE! The 2011 Shoot to Fight Cancer is LIVE! Our Relay For Life team (Connolly Tacon & Meserve: "Connolly's Crew") is off to a fabulous start -- with funds that I mailed off a few days ago, we're just shy of $20,000 in funds raised! For the last three years, I have donated a photo shoot from Finian Road and raffled it off to benefit the American Cancer Society. More than $5000 has been raised from the tickets sold for the Shoot to Fight Cancer. I introduce this year's Shoot to Fight Cancer. A photo shoot with your fam from Finian Road + the digital negatives + two beautiful gallery-wrapped 16x20 canvas of your two favorite images from the shoot...all while fighting cancer at the same time! And this year, the new addition to the prizes are the addition of a second prize and third prize -- so there will be 3 winners this year! The second prize winner wins a $250 gift certificate to Finian Road, and the third prize winner wins a $100 gift certificate to Finian Road! With the exception of the cure for cancer, I can't think of a sweeter deal. Tickets are $25 each, and there are just 125 tickets available. Great odds for a prize package worth $850! 100% of every dollar from every ticket goes to support the life-saving work of the American Cancer Society...saving lives and creating more birthdays by helping you stay well, helping you get well, finding cures and by fighting back. You can use the shoot yourself, or give it away as a gift (and you would be the best gift giver EVER!). Go to our online website for the Relay For Life.You'll see a very cute video of the Wee Ski showing off his Grand Club shirt at a Relay Regional Summit last fall. Click on the blue "donate" button under our names. We will receive a notice that your donation has been made and your ticket stub(s) will be in the mail to you within 48 hours. It will go to the billing address for the credit card used to pay for the ticket. Our goal is to sell out the tickets before the end of the month...so don't miss your chance to pick up your tickets! The drawing will be held on Saturday, April 30th at 6:00 pm, Pacific time. The winner will be announced on the blog that evening, just after drawing.